Try the essential and official Photo or video editing option on your iPhone/ iPad running iOS. This option also available in your old iOS 10 devices and New iOS 11 but a marginal modification. Just go with simple steps for Trim video on iPhone X, iPhone XS max, iPhone XR, iPhone 8 (Plus), iPhone 7 Plus/ iPhone 7 or other iPhone installed iOS 11. Some improved point also I discussed at here that may be very useful before you try it own self. Before you go for trim your video finally, please keep one copy as a backup of your video at anywhere or online cloud app for Photos/ Videos. 1: Open Photos app on your iPhone. 2: Next, Open Video on Fullscreen but don’t play. on your Preview Video screen find Edit button at the top right corner of the screen. 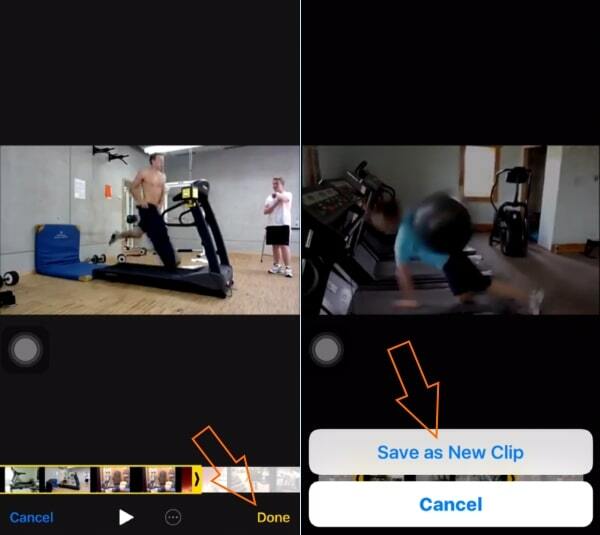 3: Now, Slide the Portion on Video and Tap on Done button to save as a new video. 1: Go to Photos app on your iPhone/ iPad. 2: Open it, See All saved videos and Easy to pick your one Tap on “Albums” from beneath tab. 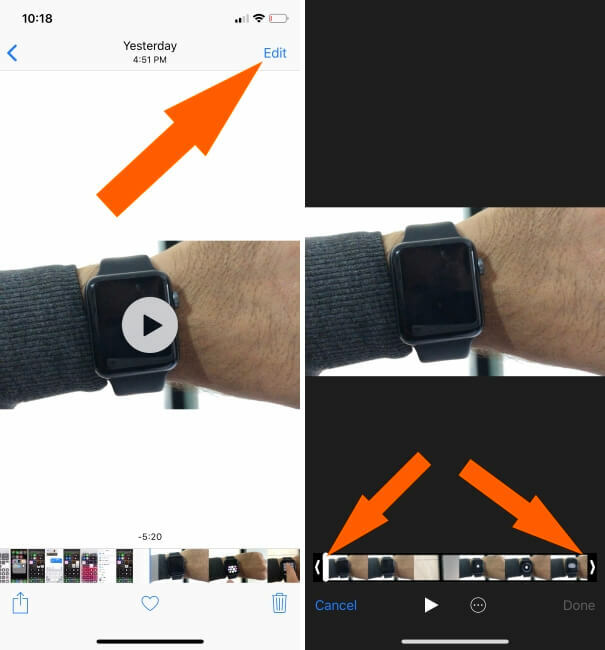 3: Tap on Video That you want Trim, Next Tap on Blue Setting/ Edit icon at top right corner of your iPhone’s screen. 4: Now, you need to drag video boundary line (Arrow mark) on Preview pan See below image. Before finally save it, Play portion of video by a tap on play button then Tap on Done. 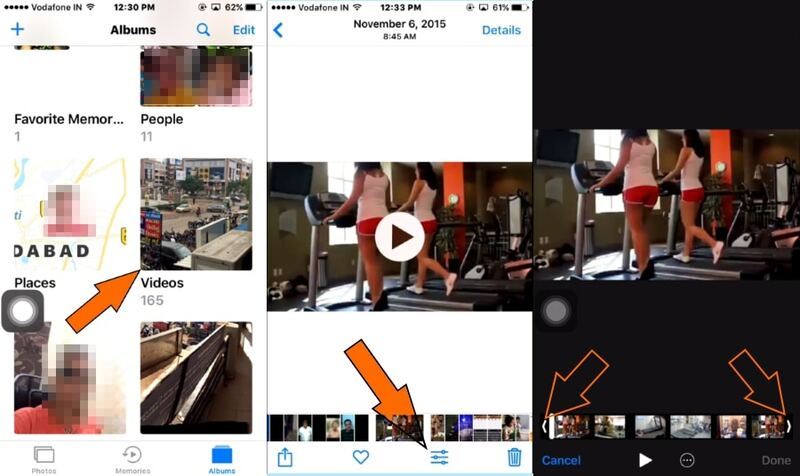 Next, Your new trimmed video saves into another copy in the same photos app. 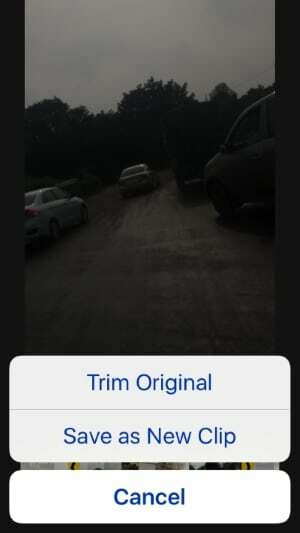 Extra Dose: Before start Trim video you have an option for edit video to other apps, like iMovie. 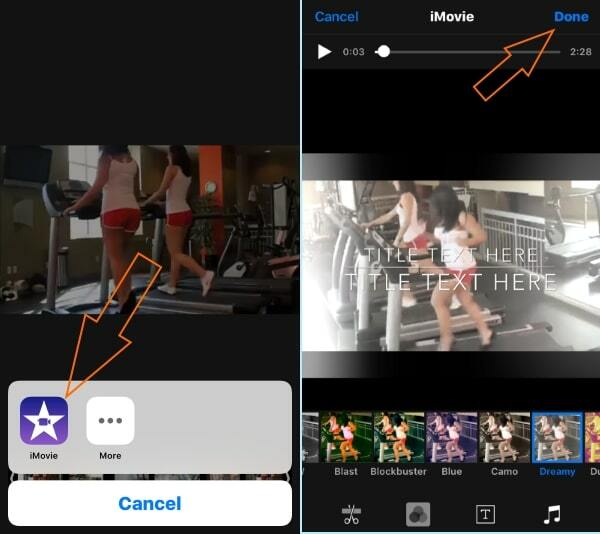 To Use Photos tap on Circle with Three dots inside icon As we know iMovie is a pro feature editing tools for Giving another sound from music app, Text on video, Change video contrast/ Brightness. 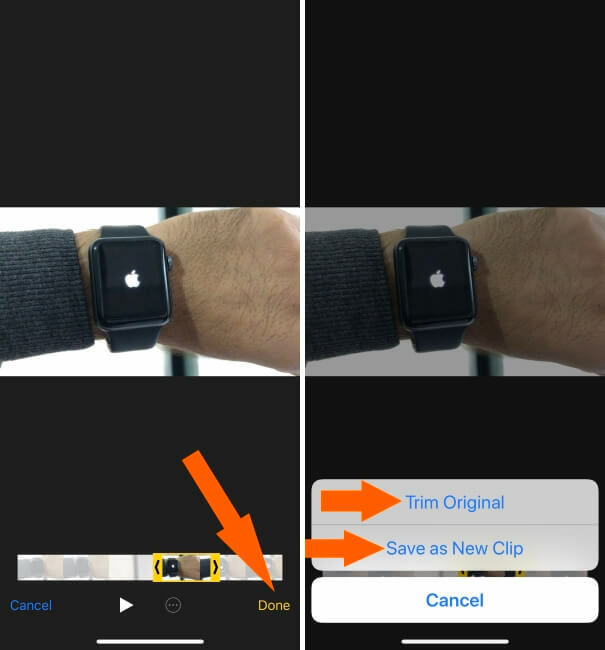 Steps Trim/ Cut Video in iOS 9 or earlier: Open video on Screen > Top right corner tap on Edit > Slide video frame limits by dragging it > Then Done. Connect with us on Facebook, Twitter or Google+ for more useful hidden tips and Tricks Like Cut/ Trim video on iPhone is an artistic gadget.